St. Petersburg, FL – To celebrate the collaborative brewing environment in Pinellas County and the industry’s shared community commitment, Habitat for Humanity of Pinellas County is engaging local craft breweries to join forces to raise $50,000 to build a home in partnership with a family in need. Habitat Pinellas launched “The House That Beer Built” initiative in 2018, and has partnered with local breweries to participate via pledges, hosting fundraising events, and support through an upcoming beer festival, scavenger hunt and other engagement opportunities. Current partners include 3 Daughters Brewing, Big Storm Brewing, Cage Brewing, Club Savor, Dissent Brewing, Dunedin Ladies of Lager, Green Bench, Flying Boat Brewing Co., Mastry’s Brewing Co., Pinellas Ale Works, Silverking Brewing Co., St. Pete Brewing, SpeedPro Imagining St. Petersburg. “Habitat is beyond excited to be working with the craft beer community here in Pinellas County. We are always looking for new and innovative ways to partner with businesses and individuals in the area as well as spread the word of the Habitat mission. We are thankful to all of the breweries who have made this project possible!” said Alison Riley, VP of Corporate Partnerships and Marketing. The Craft Beer Festival will feature unlimited samples from brewery partners (while supplies last), photo opportunities and entertainment. 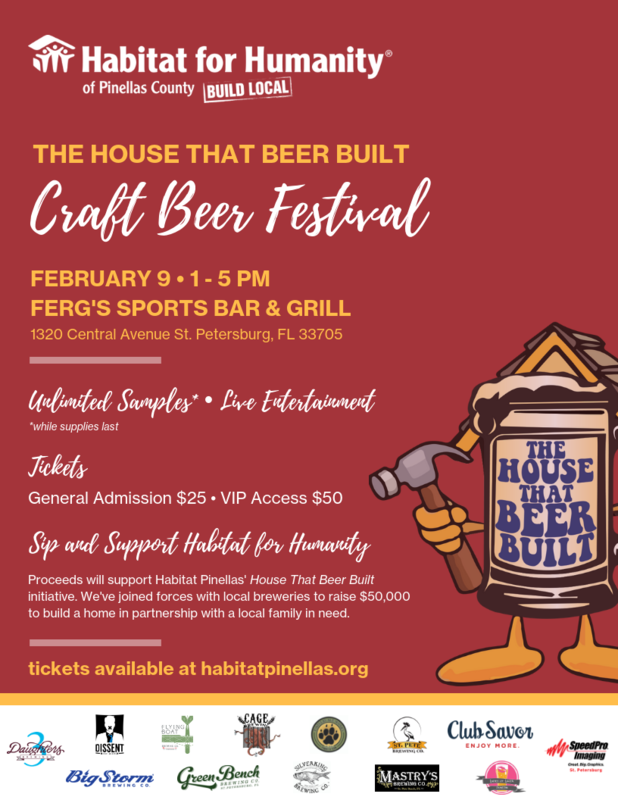 VIP ticket holders will have the opportunity to sample a new collaboration brew created specifically for Habitat Pinellas by Big Storm, Flying Boat and Dissent Brewing Co.
Habitat Pinellas is hosting the inaugural House That Beer Built Craft Beer Festival on February 9th at Ferg's Sports Bar & Grill. Tickets start as low as $25 and include unlimited samples (while supplies last) from some of the best breweries in Pinellas County, as well as live entertainment. Your General Admission tickets include a 5oz. sample cup with unlimited samples at all applicable brewery tables (while supplies last), as well as live entertainment sponsored by Ferg's. Your VIP ticket will grant special access to a VIP area with complimentary appetizers, a full liquor cash bar, swag bag, specialty beer, and a new collaboration brew created especially for Habitat Pinellas. Tickets are available at https://habitatpinellas.org/news-events/the-house-that-beer-built/. Since 1985, Habitat for Humanity of Pinellas County has constructed over 510 homes for struggling families in Pinellas County, using locally raised funds. Volunteers and the future homeowners construct the homes, which are sold at no profit and financed with a zero-interest loan. Habitat Pinellas homeowner candidates earn 30 to 80 percent of area median income. For Pinellas County, that translates to as little as $27,000 a year for a family of four. Candidates must also demonstrate need for adequate shelter; ability to pay back a zero-interest loan and willingness to partner with Habitat Pinellas to invest 350 to 450 sweat equity hours. Mortgage monies are used to build even more homes, making each donation to Habitat a perpetual legacy to the community. Habitat believes that home ownership contributes to family stability, leading, in turn, to community stability. Additionally, Habitat Pinellas raises funds through their ReStore, a home improvement outlet where donated household and building items are sold to the public. For more information about Habitat for Humanity of Pinellas County, contact 727-536-4755 or visit www.habitatpinellas.org.